Tired of randomly losing stuff from your phone? Maybe you just want to make extra room for more media? 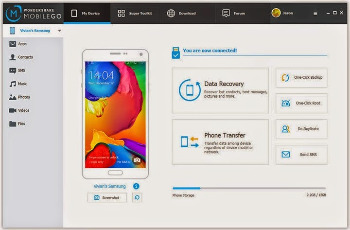 With Wondershare MobileGo portable for Android and iOS, you can back up everything, namely, contacts, SMS, apps, call logs, music, videos, photos, and calendar. Additionally, you can restore all or selected backed-up files to your Android and iOS phone with a click. – Android Fans: Backup everything to PC with 1 click & retain 100% quality. – Music Lovers: Instantly add fun stuff and enjoy media anytime, anywhere. – App Junkies: Download, install, uninstall and export apps quickly and easily, move apps to SD. – Social Networkers & Texters: Transfer contacts from/to Outlook and send & reply SMS seamlessly from your PC. – USB Cable not at hand: Manage your Android phone with or without a USB cable.